who here gave their lives that that nation might live. we can not hallow — this ground. which they who fought here have thus far so nobly advanced. Seven score and ten years ago — November 19, 1863 — Abraham Lincoln gave the speech that stirred a nation. Two hundred and seventy words. 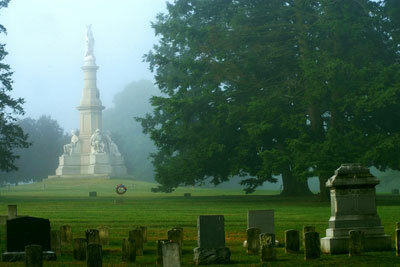 Lincoln was not even the main speaker at the dedication of the Soldiers National Cemetery in Gettysburg, Pennsylvania. Edward Everett, who was the chief speaker for the occasion spoke for more than two hours in his own address. Upon hearing Lincoln's Address the impressed Everett wrote to him the next day, "I should be glad, if I could flatter myself that I came as near to the central idea of the occasion, in two hours, as you did in two minutes." Pro Union newspapers of the day praised the address but there was also much criticism of Lincoln's address in other newspapers. One of those papers critical of the Gettysburg Address was The Patriot and Union in Harrisburg, Pennsylvania. The paper dismissed the president's "silly remarks" in an editorial. Now, on the sesquicentennial of the Gettysburg Address the current incarnation of the Patriot and Union has seen fit to retract the 1863 editorial. As for the Address itself, the world did take note and has long remembered what was said by Lincoln at Gettysburg. There are five known copies of the Gettysburg Address in Lincoln's handwriting. All with minor variations in the text. The version reproduced here is known as the Bliss Copy. It is the last known copy written by Lincoln and the only one signed and dated by him. The Bliss Copy is the version of the Address that is inscribed on the Lincoln Memorial in Washington. Today, it is on display at the Lincoln Room of the White House. The third copy, known as the Everett Copy is housed at the Abraham Lincoln Presidential Library and Museum in his home state of Illinois. Each of the five copies are named for the people who received them: Nicolay, Hay, Everett, Bancroft and Bliss.